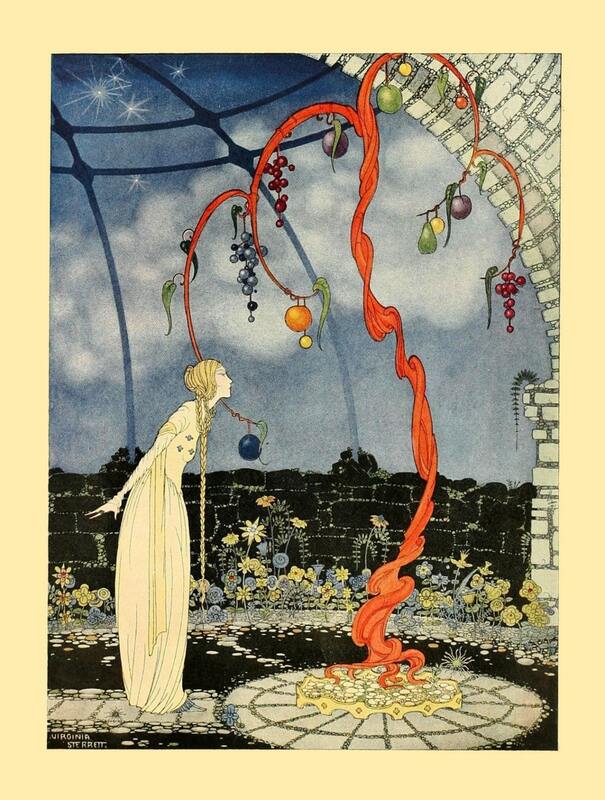 A beautiful offering from Virginia Frances Sterrett, this illustration is taken from the 'Old French Fairy Tales' . At the time she received this commission, the artist was diagnosed with tuberculosis and died just over a decade later at the age of 31. Following her death, in a tribute to her life and work, it was said "Perhaps it was the hardships of her own life that gave the young artist's work its fanciful quality. In the imaginative scenes she set down on paper she must have escaped from the harsh actualities of existence" (St Louis Post-Dispatch). In this scene, the character of Rosalie receives a tree made of precious stones, "The seeming fruits which covered the tree were of precious stones of all colors-diamonds, sapphires, pearls, rubies, opals, topazes, all as large as the fruits they were intended to represent and of such brilliancy that Rosalie was completely dazzled by them."